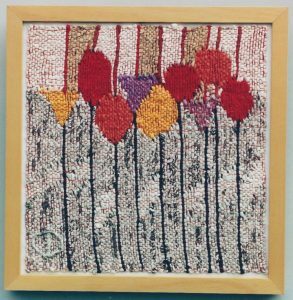 Carolyn graduated with a BFA from the University of Washington and a Masters in Art History from Mills College in Oakland, California. 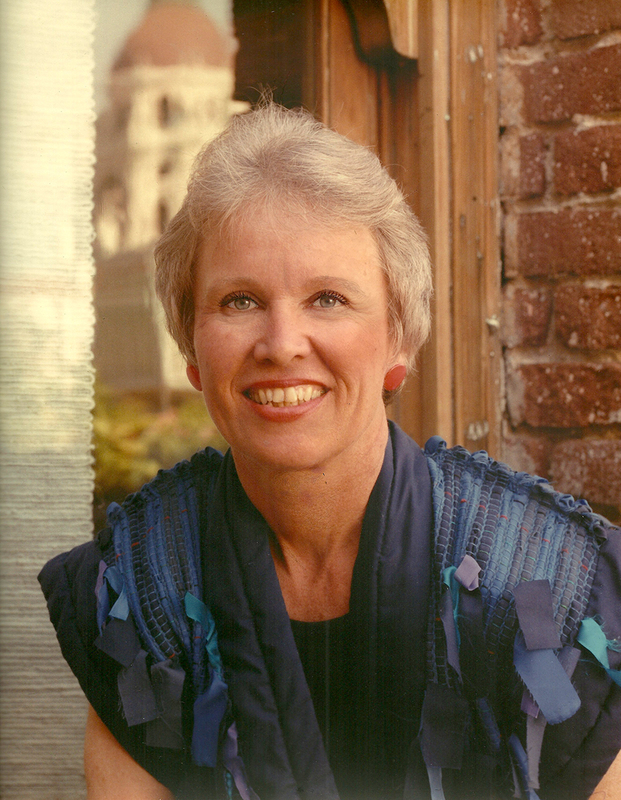 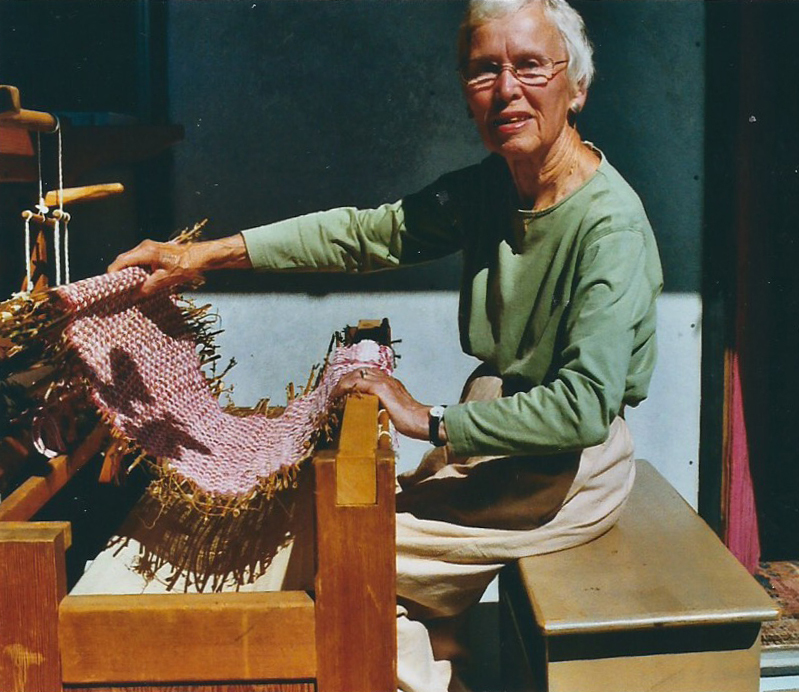 Carolyn was gifted with the spirit of creative adventure and dedicated her life to enriching the world through her visual creativity in tapestry design and weaving. 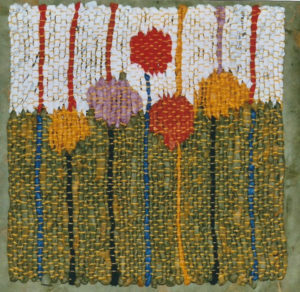 She shared this passion not only through weaving, but as a teacher, writer, painter, docent, exhibitor, gallery owner and photographer. Carolyn was a member of Tapestry Artists of Puget Sound. 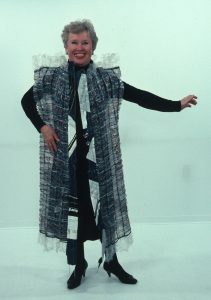 We remember her creative use of the various forms of paper that most of us put into the recycling bin, her beautifully arranged studio, her elegant manner and her unique handmade clothing. Theatre of the Birds, Green, 18” x18,” 2003, coiled paper, fiber. Theatre of the Birds, Red, 18” x18,” 2003, coiled paper, fiber. 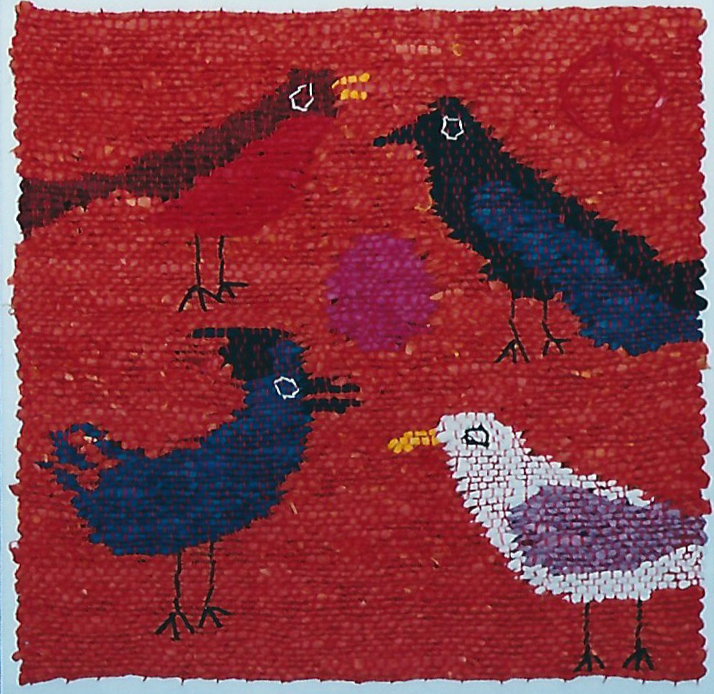 Birds on a Gravel Beach, 13” x 13,” 2005, spun paper, cotton, handwoven. 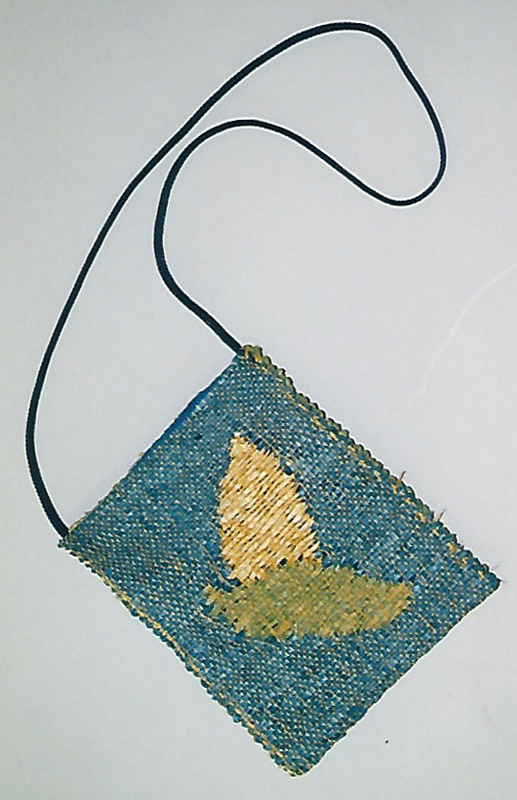 Birds on a Turquoise Coast, 12” x 12,” 2005, tapestry, spun papers and cotton warp. 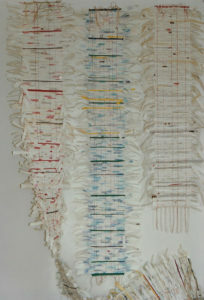 Collection: Pay and Sam Smith. Purple/ purple. 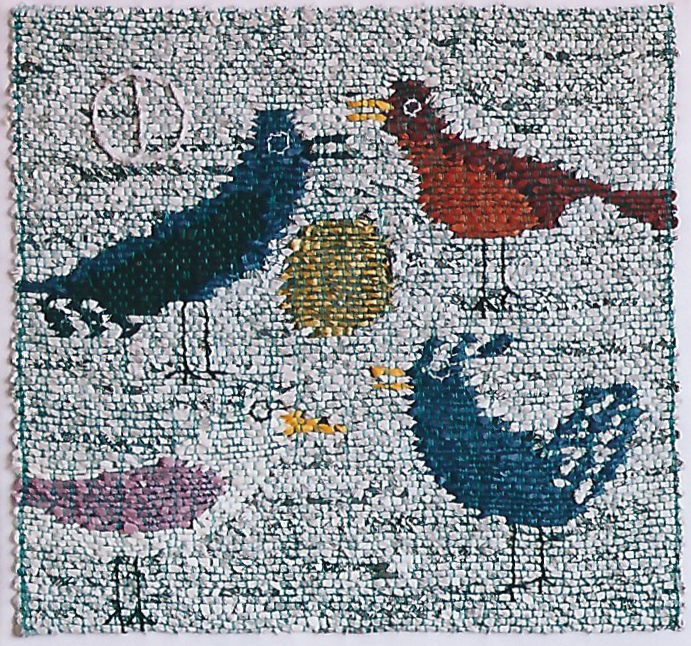 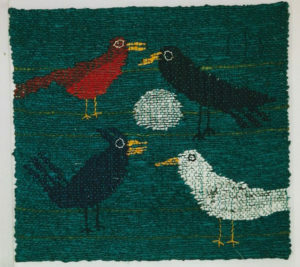 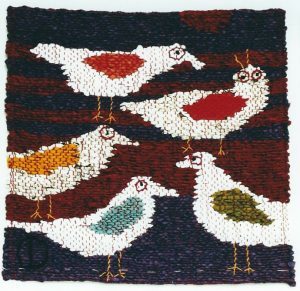 5 Birds, 12” x 12,” 2009, tapestry. Shawnee Birds, 12” x 12,” 2004, loom woven tapestry, Asian papers, embroidery. 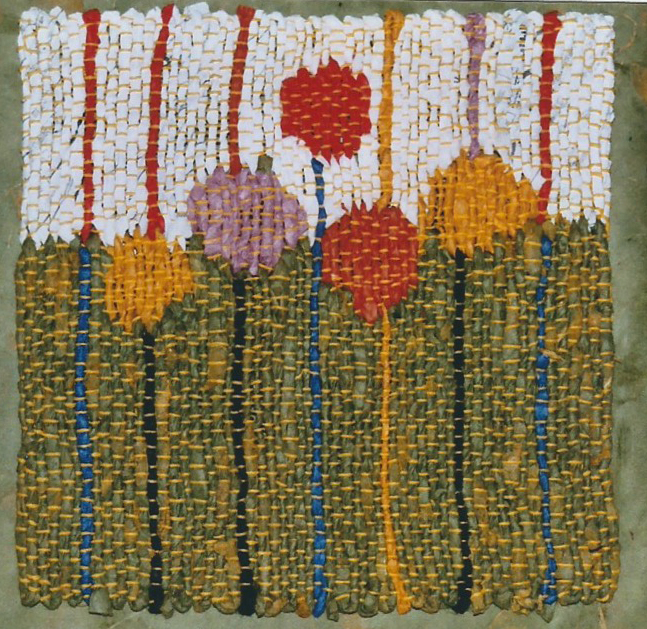 Moon in Madronas, 18” x 18,” 2002 coiled paper, fiber. 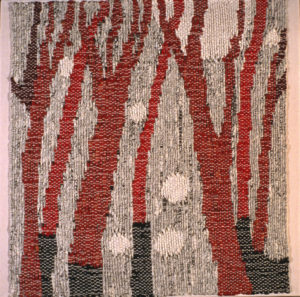 Three Red Trees, 18” x 18,” 1998, wool on cotton warp. 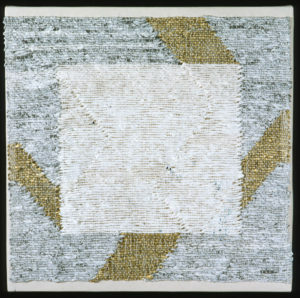 Caucasian Flower Field, White, 12” x 12,” 2009, tapestry, handspun paper, woven. 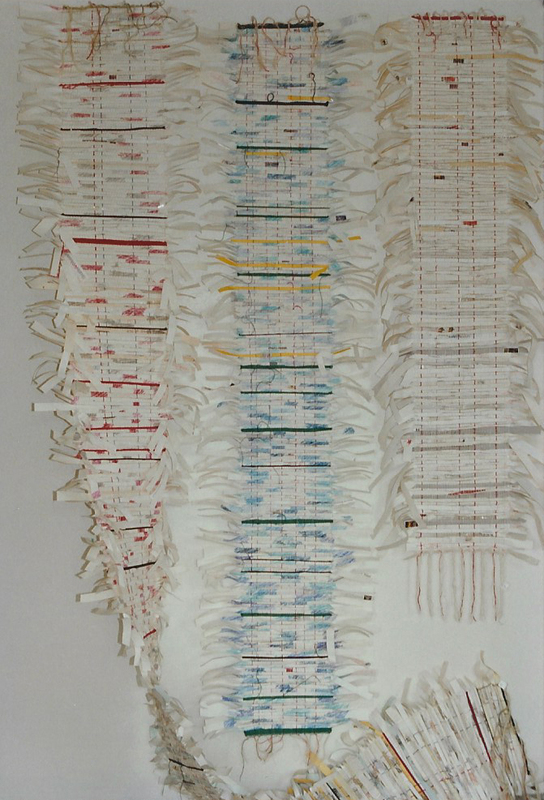 Collection: Liz Theaker. 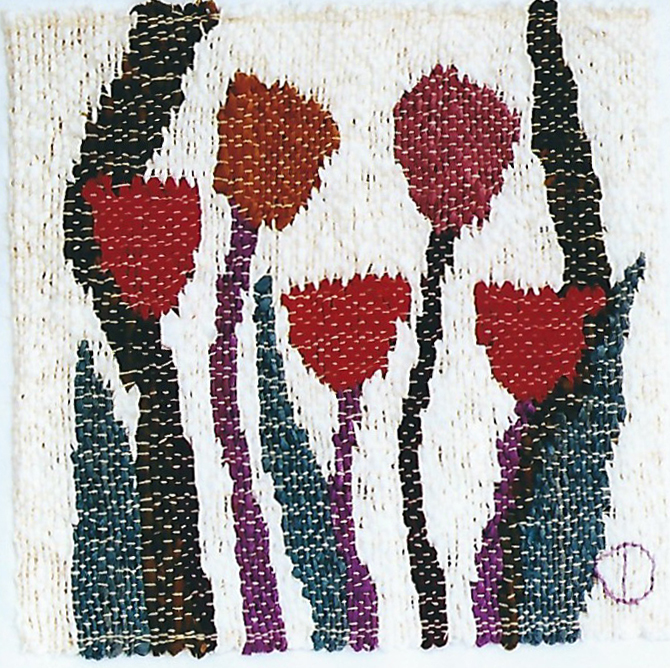 Caucasian Flower Field, Red, 12” x 12,” 2010, tapestry, handspun paper, woven. 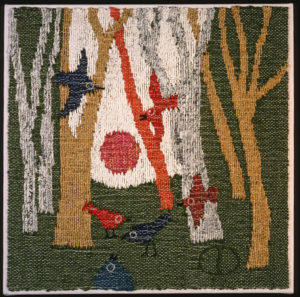 Garden and Grass, 8” x 8,” 2008, tapestry, handwoven paper. Collection: R Campbell. 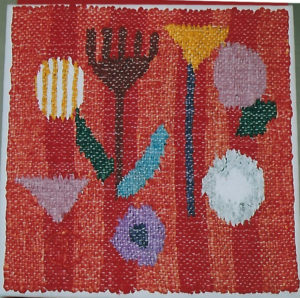 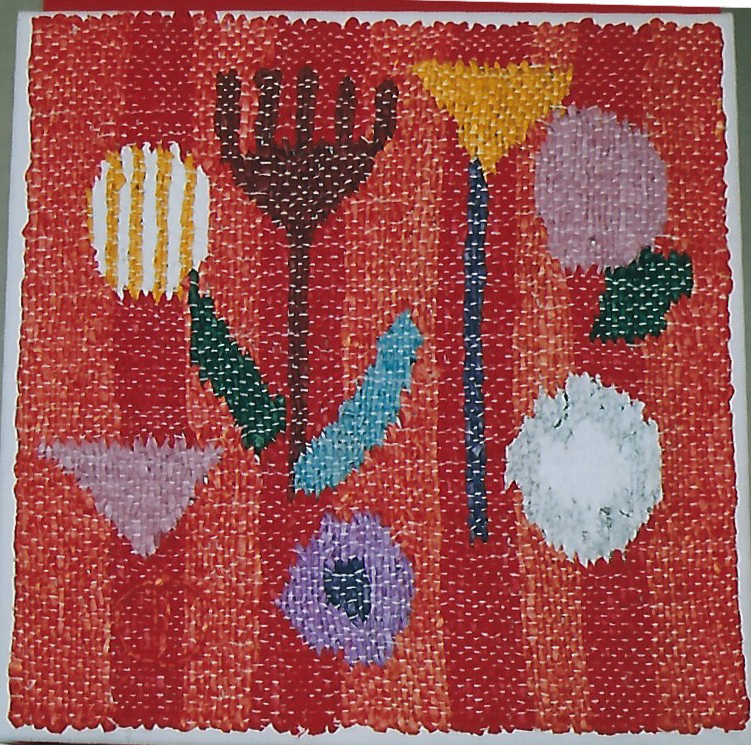 Garden and Gravel, 8” x 8,” 2008, tapestry, handwoven, paper. 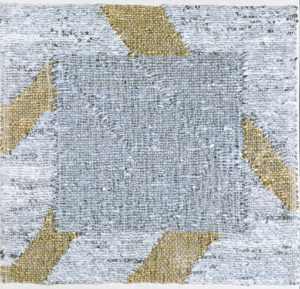 Collection: Slyfield. 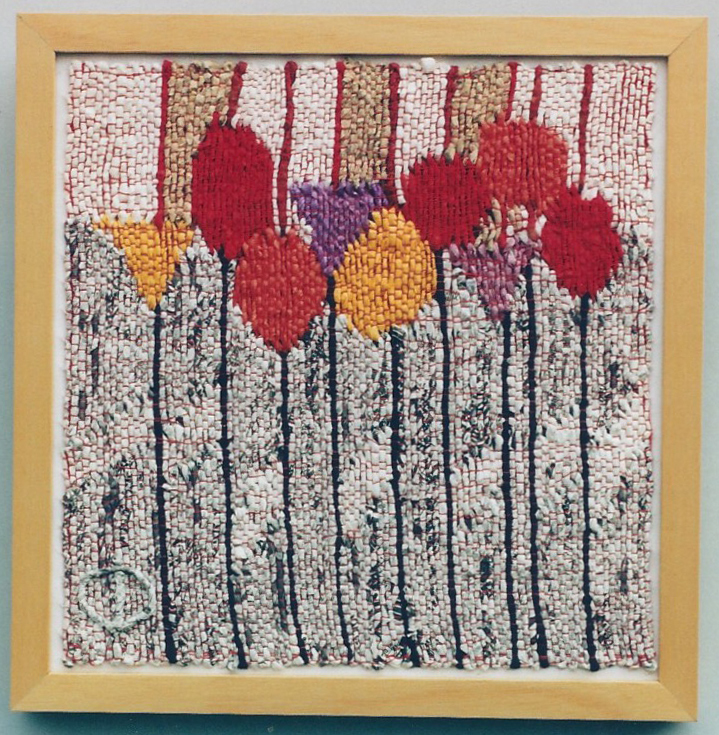 Posies and Pickets, 8” x 8,” 2008, tapestry, handwoven, paper. 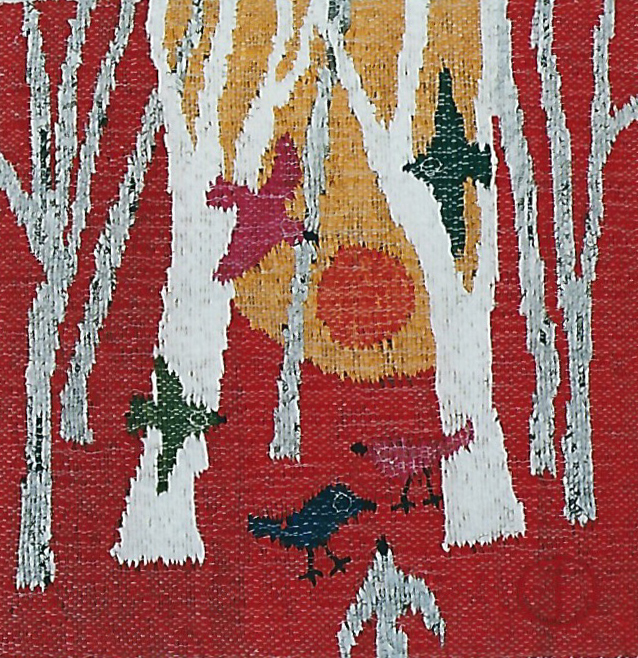 Collection: Chapelle. 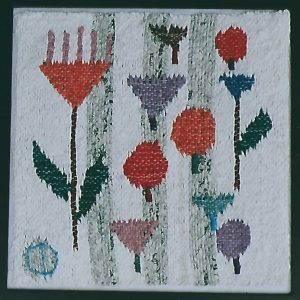 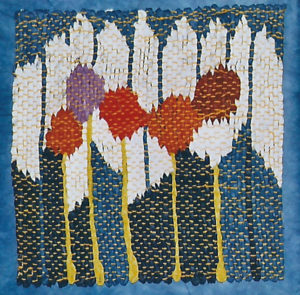 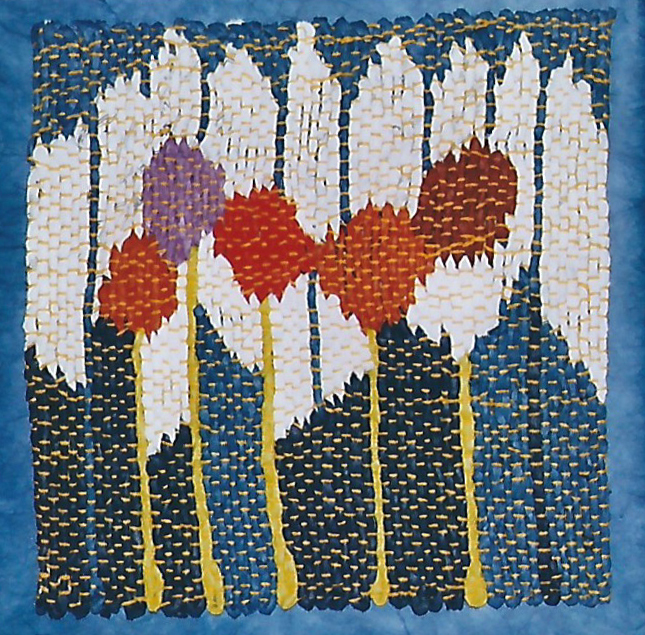 Tulip Garden, 12″ x 12,” 2009, tapestry. 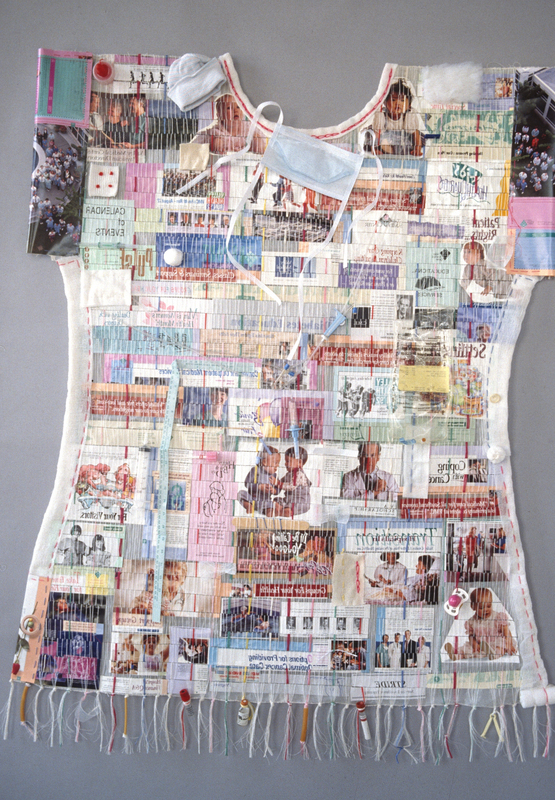 Collection: Perry Berend. 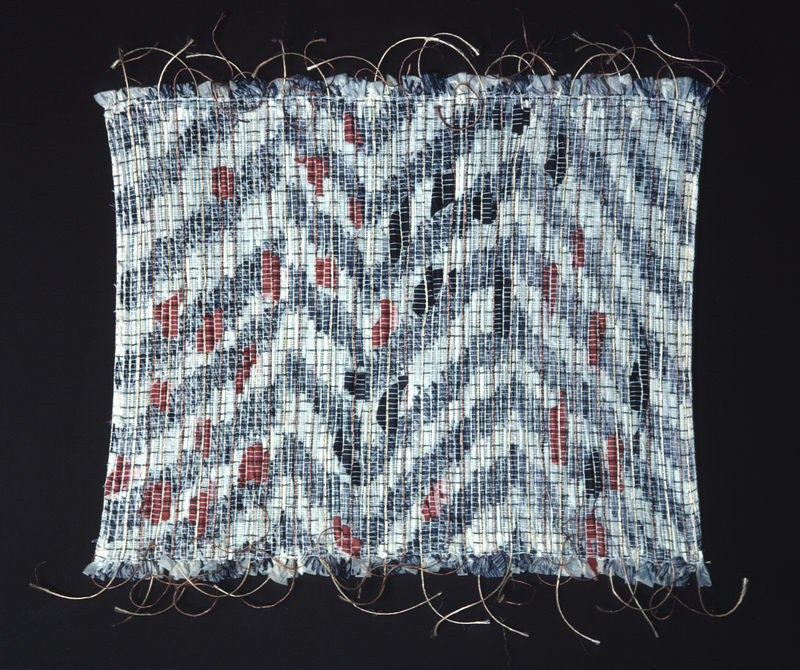 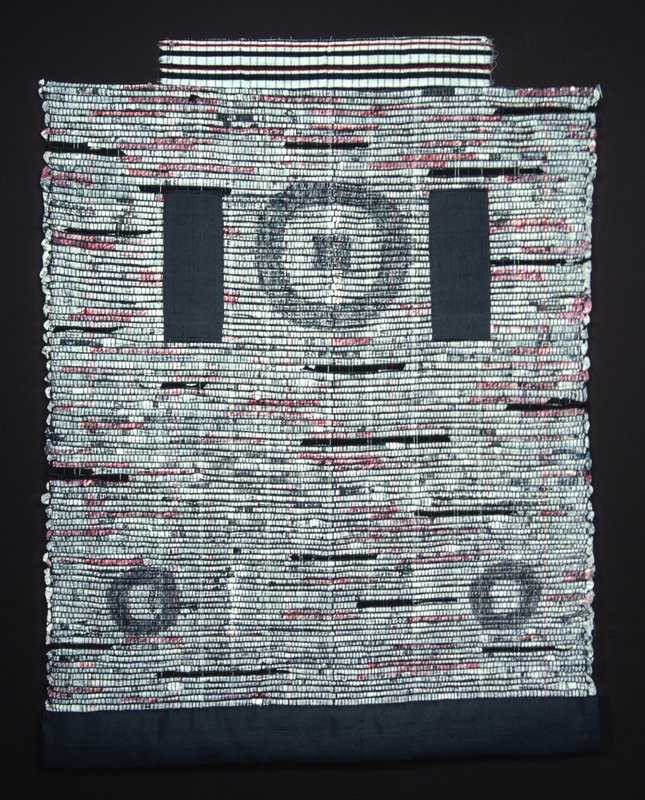 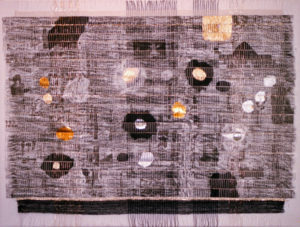 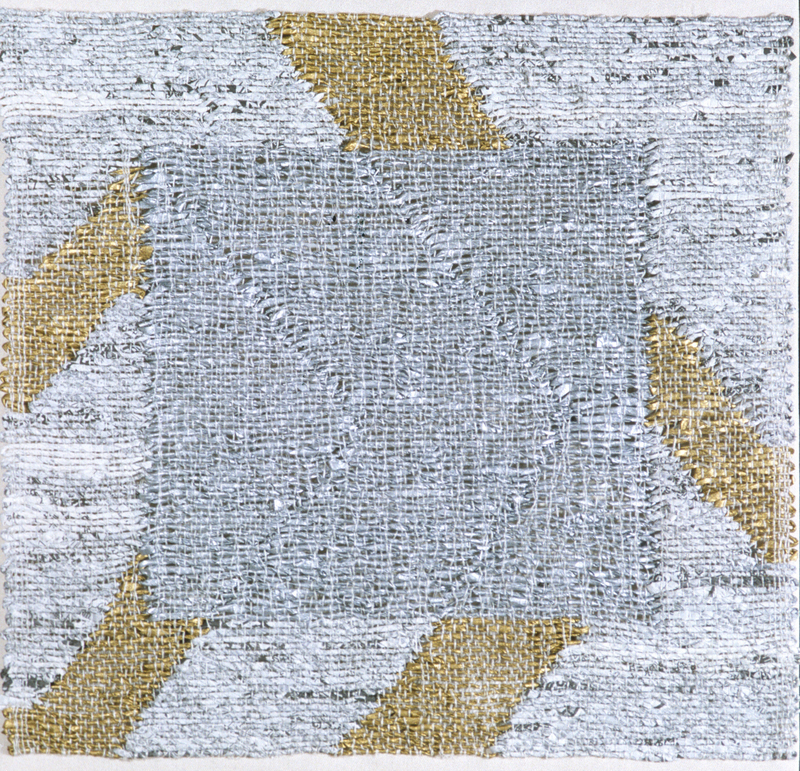 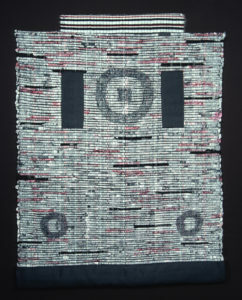 Silver Till, landscape, 18” x 18,” 2000, mixed media, tapestry. 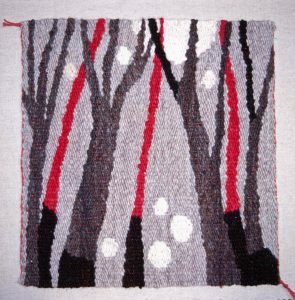 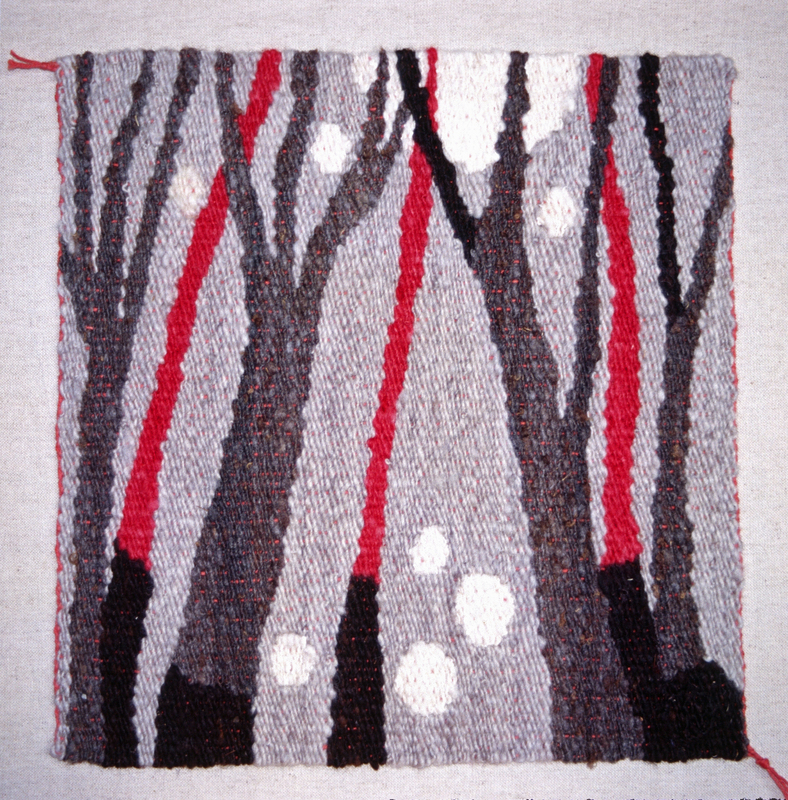 Winter Till, landscape, 18” x 18,” 2000, mixed media, tapestry. Black Cosmos, 30” x 40,” 1996, mixed media collage. 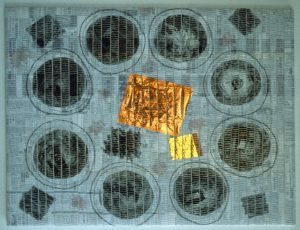 Golden Mandala, Mandala Series #3, 40” x 30,” 1993, oriental newspapers, fiber, foil. 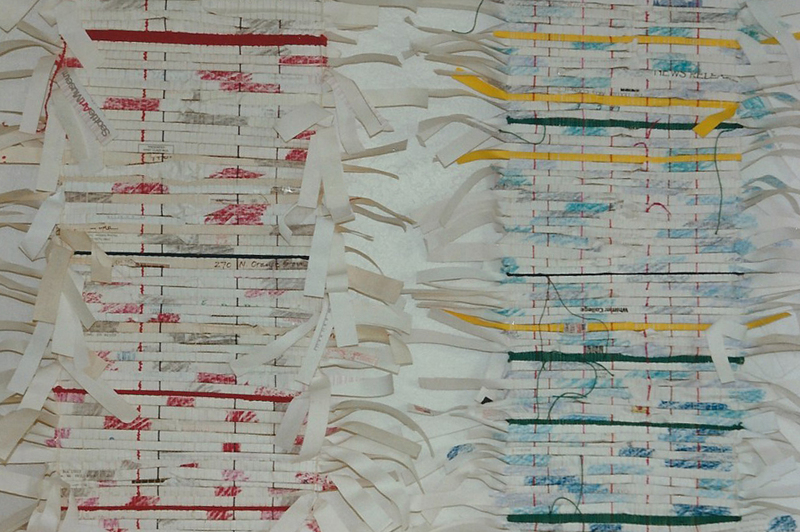 Three Woven Columns, 120″ x 20,” 1993, personal dated envelopes, colored, collaged, cut. 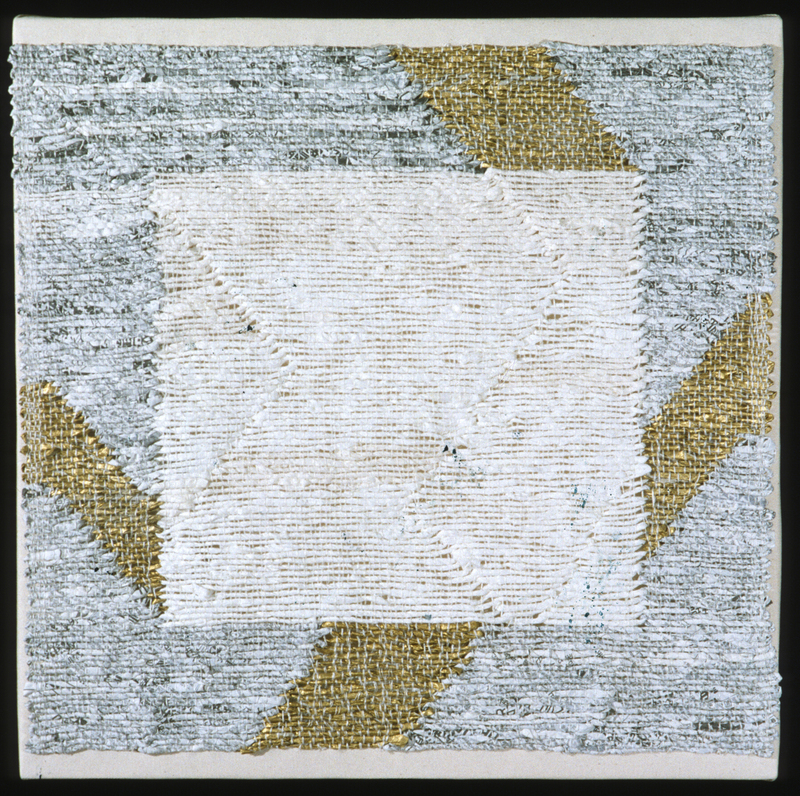 Artnews for Harry Anderson, Coat of Mail series, 1990, plastic, fibers, paper, collage, woven, taped. 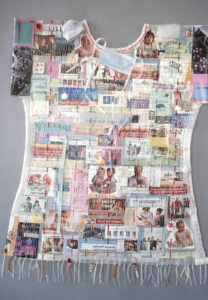 Hospital Gown II, 5’ x 4,’ 1993, mixed media collage, woven, stitched. 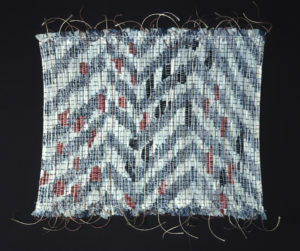 Collection of Valley Medical Center, Renton. 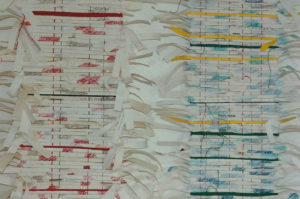 Kyoto Mon, Travel Document Series, 55” x 44,” 1988 , Asian Papers, fiber, silk, collage, painted, woven. 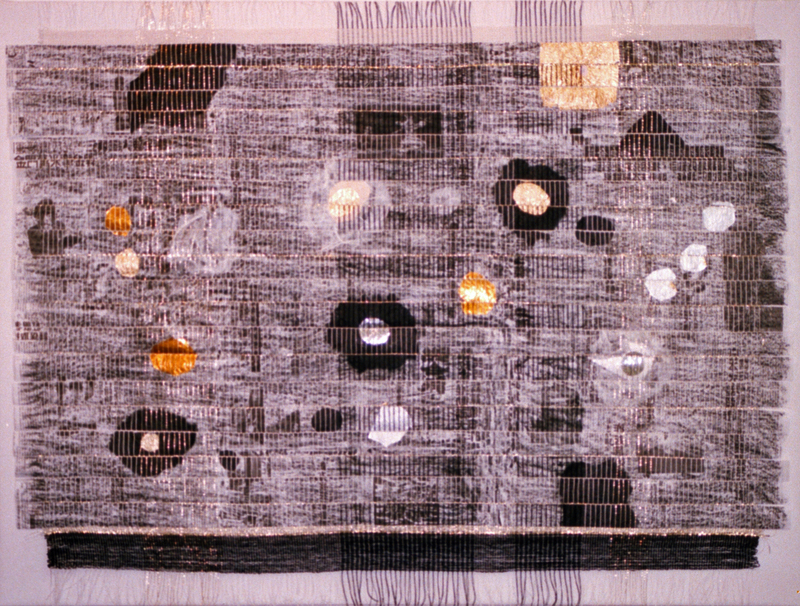 Kyoto Mon, Travel Document Series, 55” x 44,” 1988, Asian Papers, fiber, silk, collage, painted, woven.